Findlay Market is celebrating the 100th Annual Findlay Market Opening Day Parade! 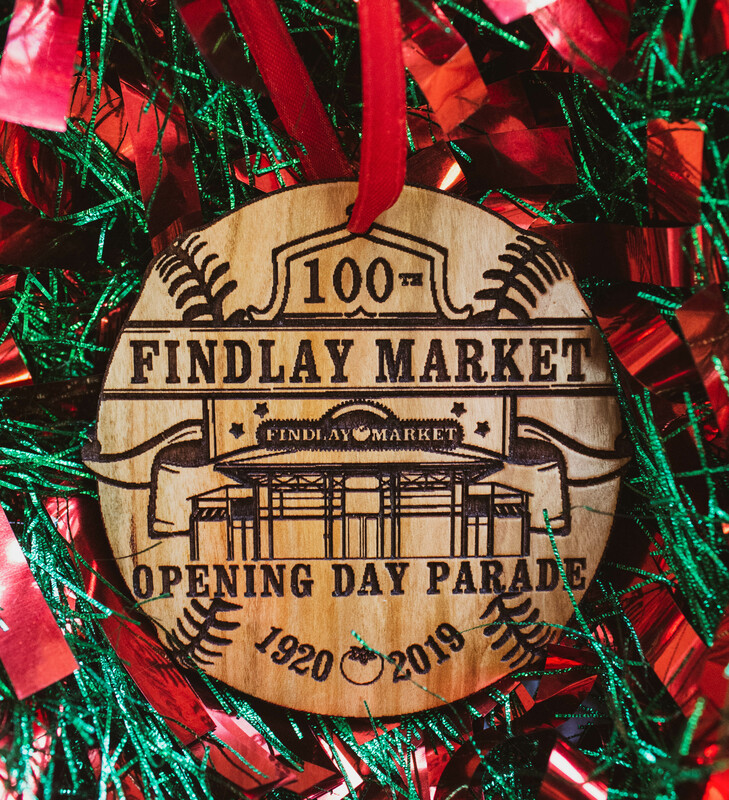 Commemorate this momentous anniversary with a handmade wood ornament created by Branded Woodworks, a local Cincinnati artisan and Findlay Market Merchant. Branded Woodworks is owned and operated by a husband and wife duo specializing in artistry, fine woodworking and laser cutting/engraving services. This is a perfect gift for anyone who has made the Opening Day Parade a family tradition or any Cincinnati Reds fan in your life. You can purchase the ornament online here. Our friends at Rookwood Pottery partnered with us to create this beautiful, limited edition holiday ornament. This handcrafted piece of art is completely unique; no two pieces are exactly alike. This ornament makes a stunning addition to any holiday tree. The Findlay Market Cookbook celebrates the food, the people, the eccentricity and enduring legacy of Findlay Market. Oh, and it makes a pretty swell gift! More than 100 recipes featuring market merchants, farmers and food artisans. Recipes from some of your favorite local chefs, including Jean-Robert de Cavel, Stephen Williams, Todd Kelly, Julie Francis, Jose Salazar and more. Many recipes accompanied by heartwarming profiles and photos. Eclectic mix of recipes for every meal of the day, plus others sure to impress guests. Written by Edible Ohio Valley's Editor, Bryn Mooth, with photography by Julie Kramer, the book is the third in a series of cookbooks focused on public and farmers’ markets from Farm Fresh Books, an independent specialty publisher headed by Michael Turback. Cookbook available at the Findlay Market Center & DIRT: A Modern Market. A portion of the proceeds benefit the Findlay Market Fund. The Downtown Cincinnati Inc. Gift Card is the perfect present for anyone who wants to enjoy the great variety of fabulous fresh and prepared foods, fresh flowers, local arts and crafts and a quintessentially urban shopping experience at Ohio's oldest public market. You can purchase gift cards in person at the Findlay Market Center (located across from Taste of Belgium in center of main market house) on Tuesday-Friday from 9 AM - 6 PM, Saturday from 8 AM - 6 PM, or on Sunday from 10 AM - 4 PM. Or you can purchase them online anytime using your Discover, MasterCard, Visa or American Express and your purchase will be promptly mailed to you. To view the complete list of participating Findlay Market vendors* and to purchase online please visit downtowncincinnati.com. *Only those vendors at Findlay Market that accept credit/debit cards will be able to accept the Downtown Cincinnati Gift Card.